Did you know that we Americans eat as many as 50 billion burgers a year — an average of three a week for every man, woman and child — enough to circle the globe 32 times? From fast food to gourmet extravaganzas garnished with gold leaf, we do love our “boigers” — maybe not as much as the Brit who legally changed his name to “Bacon Double Cheeseburger” (Google it). But love them we do. By some accounts, the hamburger’s origins date to 4th century Rome: an ancient cookbook offers a recipe for isicia omentata (that’s “seasoned beef patty” to you). Kublai Khan introduced steak tartare to vast swathes of newly conquered lands. Early German immigrants to these shores hankered after “Hamburg steaks” from home, and soon New Yorkers were adding “Hamburg-style American fillets” to their menus. Something resembling the modern burger and bun emerged by the late 1800s, with many contenders claiming a role in its invention. By World War I, hamburgers on a bun were a “thing.” And in 1921, White Castle officially introduced burgers to the masses. Fast forward to 2016, as we counted roughly 80 establishments in CoMo alone that offer some version of this now iconic American food. We’ve shared just a few favorites here. But if you’ve read this far, we know you have definite favorites of your own. So, let us know what those are. Chef and co-owner Charlie Kurre has flipped burgers behind the BOOCHES BILLIARD HALL bar for 31 years — a long time, though not as long as the history of the joint that’s been serving up food since 1884. Kurre moved to Columbia after a stint in the Navy and stayed ever since. In 2004, he bought the restaurant with co-chef Rick Robertson. putting hot dogs with chili on the menu, but the demand just wasn’t there. Kurre serves around 450 cheeseburgers a day during the school year, using an ice cream scoop to measure out a quarter pound of beef that he shapes into a patty. Swiss American cheese sits between the bottom junior bun from Hy-Vee and the patty. Three or four pickles top the burger, enough to cover its circumference, along with rings of white onion, and ketchup and mustard — served on the iconic wax paper. Fans of “The Simpsons” will appreciate ADDISON’S Super Deluxe Happy Fun Time Burger. This 6-ounce patty made with local beef features creamy horseradish sauce, double bacon, marinated cucumbers and pepper jack cheese. “Our grill doesn’t taste like anybody else’s grill. No grill tastes the same; the grill imparts the flavor on the burger that you can’t get anywhere else,” says owner Jeremy Brown. One of 11ELEVEN chef Benjamin Randolph’s personal favorites is the Chipotle Burger — with chili lime aioli and house-made pickled jalapeños. All burgers are built in a specific order: the bottom bun always has Bibb lettuce (mild flavor), then pickles, tomato and, last, the onion. 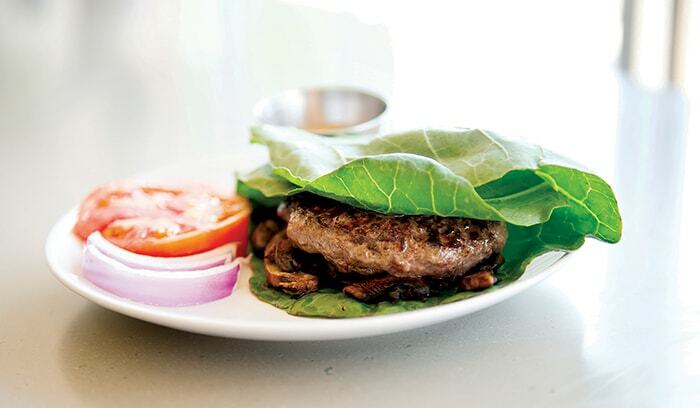 The lettuce acts as barrier protecting the toasted bun from getting soggy thanks to the juicy half-pound burger. Melted cheese also helps the burger stay together. Sauce always goes on the top of the artisan, preferably sourdough, bun. “The patty is basted in its own juices as it cooks and also creates a good sear on the patty, developing greater strength in flavor,” Randolph says. All the patties are a half a pound. The BROADWAY DINER’s Worlds Collide Burger features bacon and a sunny side up egg on two 5-ounce patties, served on a homemade glazed donut — created late one night at a customer’s special request, says owner Dave Johnson. Bring an appetite! This GLENN’S CAFÉ heavy weight is made with slow-cooked, braised beef short rib — stuffed within the patty itself. Say, what?! The short rib is cooked with a savory creole mustard sauce that complements the burger’s saltiness. 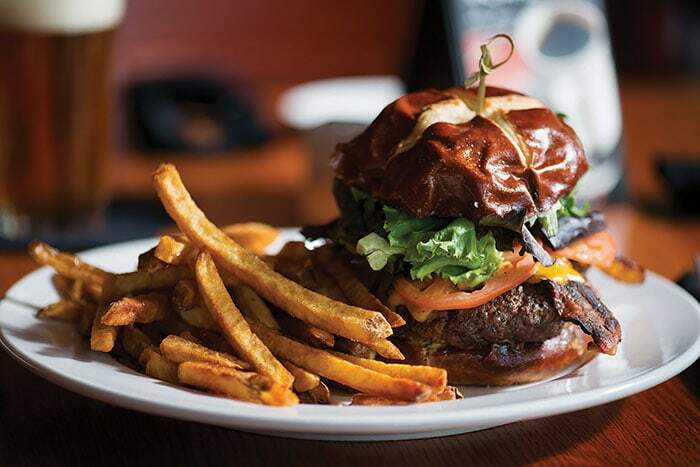 Ten ounces of ground beef patty are then packed with the short rib blend, all nestled inside a large pretzel bun. The chef specifies that at least two slices of cheddar cheese are added to the burger and topped with applewood-smoked bacon. Artisan greens and a couple of tomato slices go on right before this burger’s coronation with its top bun. Fresh cut French fries sprinkled with coarse salt are the favored side. The Brie Burger is what an inventive collaboration with cooks in the kitchen will get you, says owner Brian Coley of COLEY’S AMERICAN BISTRO. Take a charbroiled 6-ounce patty with caramelized onions and add dried cranberries and melted spreadable brie, served on a gourmet sandwich roll. “If I’m going to break my diet on a burger, I’m going for the Brie Burger: I’m going all out,” Coley says. A side of pepper jack mac and cheese completes the feast. JUST JEFF’S STREET FOOD cart and “parking lot” stand owe everything — even the name — to owner, Jeff Spencer. Growing up, Spencer watched his family flip burgers at their Boonville Livestock Auction Barn where there was always plenty of fresh beef that Spencer was eager to sample — once eating 13 burgers in one sitting, he says. Today, he cooks burgers seasoned with what his wife, Nicole, calls “Jeff’s Secret Blend” — a trial and error combo of favorite childhood spices. It gets sprinkled on each quarter pounder as it slides onto the hot griddle, where it’s cooked until crisp on the edges. The slice of Swiss American cheese goes on the bottom bun, followed by the patty — a trick Spencer swears keeps the bun from getting too soggy. It’s the customer’s job to figure out the rest. Slabs of tomato, diced red onion (more flavorful then white or yellow counterparts), pickles, jalapeños and more are heaped, self-serve, for the taking. When THE HEIDELBERG opened in 1963, cheeseburgers were only 90 cents. While times and prices may have changed, “The Berg’s” devotion to burgers has not. “Our burgers are made with love,” says Richard Walls, whose father passed the restaurant down to Richard and his brother. In the last few years alone, The Berg has sold over 32,000 “Heidelburgers,” its most popular offering made with American cheese and hickory-smoked applewood bacon atop a 6-ounce patty. Another favorite, The Frisco, rocks both Swiss and cheddar cheese and Thousand Island dressing, all on sourdough bread. When The Heidelberg was destroyed by a fire in 2003, the decision to rebuild the restaurant was easy: “It’s a part of all our lives,” Walls says, and CoMo history, too. 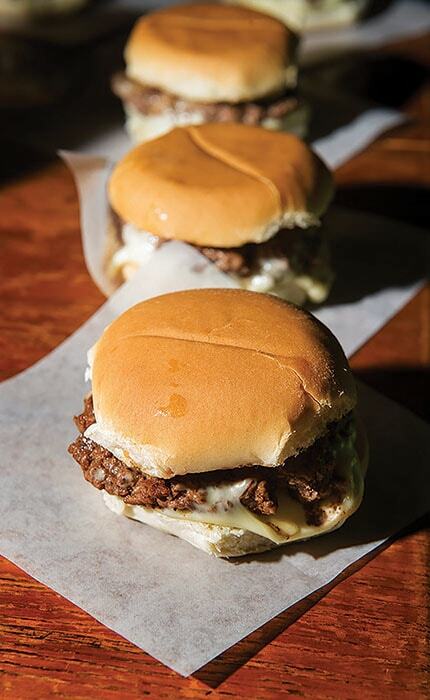 Tucked in the heart of the University of Missouri campus, MORT’S IN THE SHACK is the spot to soak up Mizzou tradition. 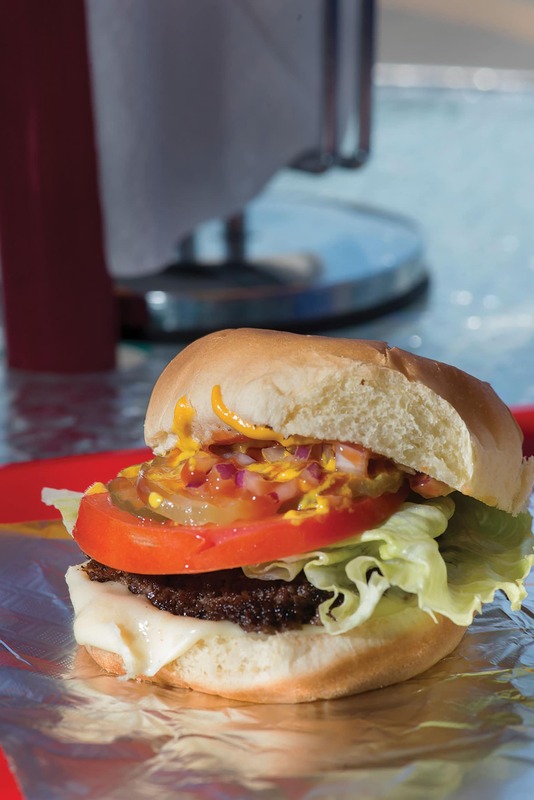 “The Shack and Cheese is a throwback to those days gone by,” says chef Jeff Moroni: it’s a half-pound of burger, sourced from Legacy Beef and charbroiled on the grill, topped with cheese, lettuce, tomato and the signature Shack Sauce. The sauce has been around for at least 70 years, passed down on a small piece of paper from the Franke family, owners from 1962 to 1988. It all started with a sandwich cart back in the ‘20s. Although locations and owners have changed over the decades, The Shack still attracts loyal fans and a famous alum or two (e.g. Mort Walker—creator of Beetle Baily comics). 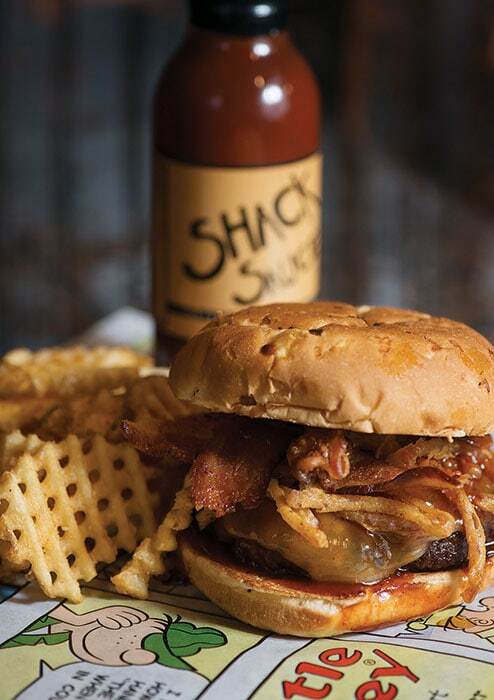 The Shack’s vinegar-based secret sauce includes celery seed, ginger, paprika and liquid smoke, flavors that transform when tasted with the burger. One thing that doesn’t change is the magic of Mort’s, still bringing generations together to savor their burgers and carve their names on the wall. Bite into the Biscayne Burger to understand what true ROOM 38 flavor tastes like, says chef Jeremy Bowles. Starting with a half pound of ground Angus beef, the burger is topped with fresh pico de gallo, pepper jack cheese, a fried egg and sliced avocado. No condiments distract from the burger’s rich flavor, complemented with the unexpected yet simple sweet potato bun. Pair the burger with string fries for a classic burger experience. Made with ground beef from Covered-L Farm in Centralia and mixed with egg, garlic powder, sea salt, pepper, avocado oil and secret Nourish seasoning, the Local Nourish Burger is topped with onion, tomato, sautéed mushrooms and house-made vegan cashew Thousand Island sauce. 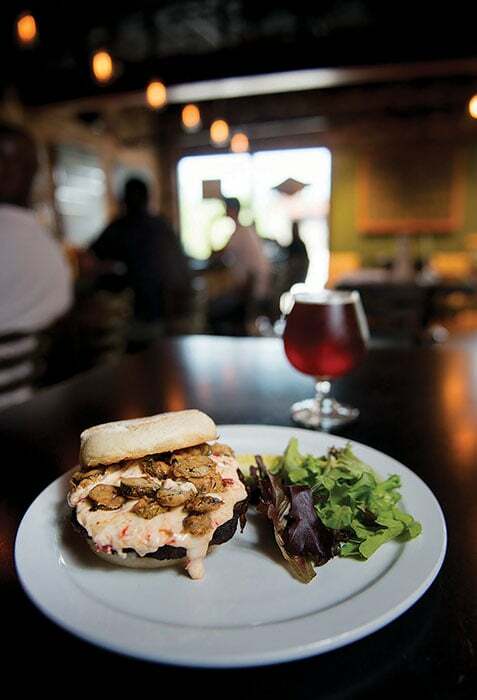 “We toyed with the idea of doing a beef burger,” Aaron Warren, co-owner of THE WOLF’S HEAD TAVERN, says. “But there are so many good burgers, downtown especially.” Instead, Warren and co-owner Trey Quinlan kept their burger offering special by serving only one — and a vegetarian black bean burger, at that. “You almost don’t realize it’s not meat,” Warren says. (Our taste testers agreed!) Corn and black beans are its main ingredients. Topped with a house-made pimento cheese and deep-fried jalapeno rings, it’s delish! In a nod to the eatery’s Irish pub style, the burger, left, is served on an English muffin. Mac and cheese is one popular side; roasted potatoes (more Irish influence) cut into quarters and seasoned, baked, then fried, are a lighter option. Manager Brandon Kewley’s grandparents opened MUGS UP DRIVE IN 61 years ago — enticing customers from the get-go with their secret house-made seasoning and chili. The business remained in the family when Kewley’s parents met there: his mom worked as a carhop while attending Hickman High School. Kewley keeps family traditions and recipes alive, including the house-made root beer served in their well-known root beer floats. 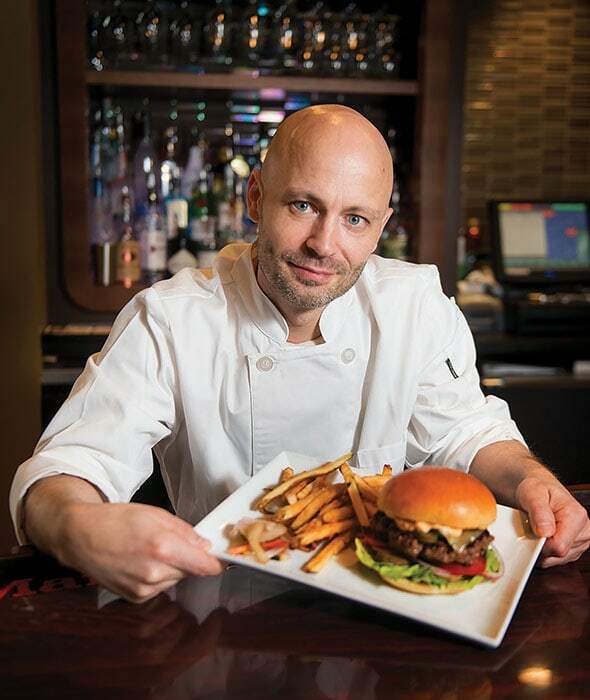 WINE CELLAR & BISTRO’s WC Béchamel Burger takes its inspiration from local-only ingredients, chef and co-owner Craig Cyr says. 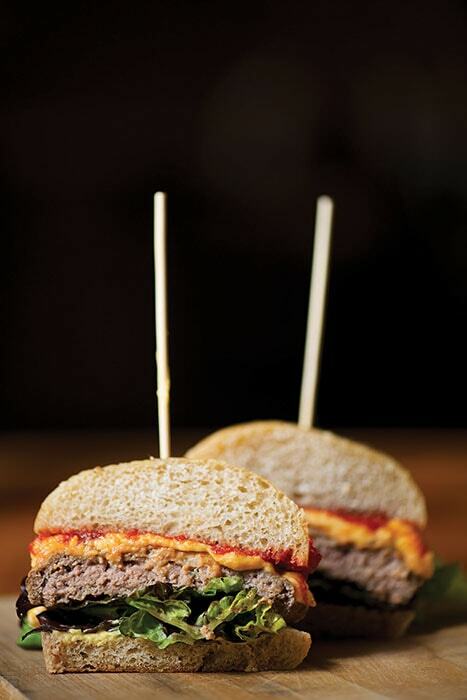 The 4-ounce patties are a blend of grass-fed beef from Covered-L Farm and Patchwork Farm ground. The burger is cooked in a cast-iron skillet and topped with the house-made fermented ketchup, Dijon mustard, a smoky cheese sauce and greens. A whole wheat focaccia made in-house completes the burger before being served as two halves on a wooden block, perhaps with a side of truffled pommes frites or a salad. 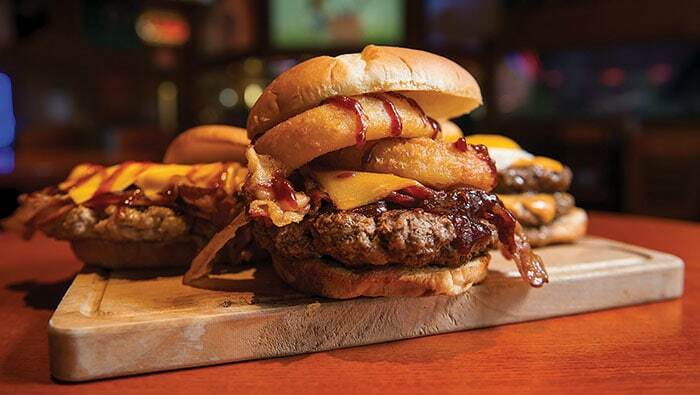 Stadium Grill’s got burgers. Lots of them: give or take 20 at any given time. The restaurant is revamping its menu this fall. Gone is The Hail Mary Burger Challenge — a 5-pounder topped with fried eggs, bacon, onion straws and pulled pork, served with a pound of fries, that had to be eaten in under an hour. No one has earned bragging rights in the last seven years. Instead, tackle any of the specialty burgers on a new menu that will include the Pigskin and the Ragin’ Cajun, back by popular demand! Stadium burgers are offered as an 8-ounce patty or chicken on a Hawaiian roll. Favorite sides are sweet potato waffle fries or house-made onion rings, and house-made sauces like the chipotle barbecue, made from a habanero base.